Kale is insanely good for you. It's packed with Vitamins A & C, and is also rich in beta carotene, potassium, calcium, and phytonutrients that are believed to help fight cancer and repair cells. Kale is like the Hulk of cruciferous vegetables, bulging with nutrients and antioxidant properties. But with all healthy foods, comes the question of taste. It may be a superfood uber-veggie, but if it doesn't taste good, I'm not gonna eat it. (I'm a grown up so I'm allowed to say that). Kale newbies may be dubious, but with the right preparation and wise selection of the type of kale to best fit the dish, this healthy, versatile veggie will become a staple in your diet before you know it. I most often see two different types of kale at the market. Curly Scots kale and Tuscan kale (also called cavolo nero, black cabbage, lacinato, or dinosaur kale). Curly kale has a hearty texture and a brassy minerality to it. This type of kale lends itself well to wintry soups, stews, even pasta dishes. Either way, it's best cooked to soften the bite a bit. 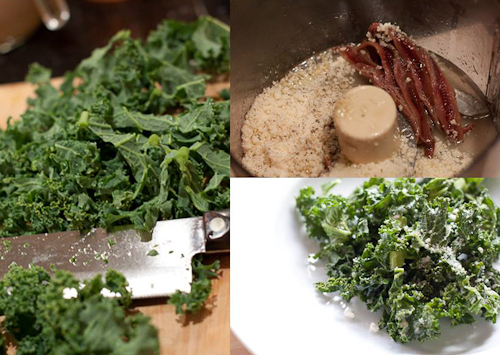 For raw preparations, like salads, or a simple sauté, I much prefer Tuscan kale. I tried making a version of Caesar Salad using both varieties and found that the curly kale was tough to eat raw (like eating raw broccoli), while the Tuscan kale's texture was much more amenable and still held up well under dressing. Lately I've been obsessed with this Tuscan Kale Caesar Salad. Adapted from Melissa Clark's recipe from In the Kitchen with a Good Appetite, I replace pecorino with parmigiano, and add salty, briny anchovies to create a Caesar dressing. I'm a big proponent of chopping my salads, and this one is no exception. Here, I chiffonade big leafy bunches of kale into a pile of ribbons before tossing them in my thick, creamy dressing. Greg from SippitySup makes a very similar riff on this recipe too. 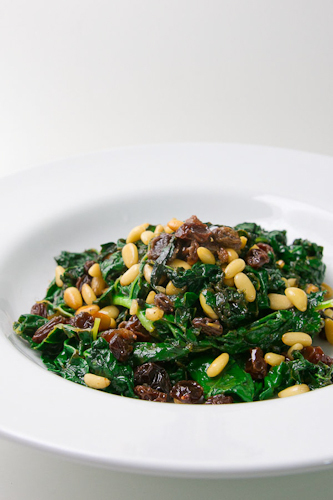 Sauteed Kale with Raisins & Pine Nuts, for a sweet, nutty, side dish. 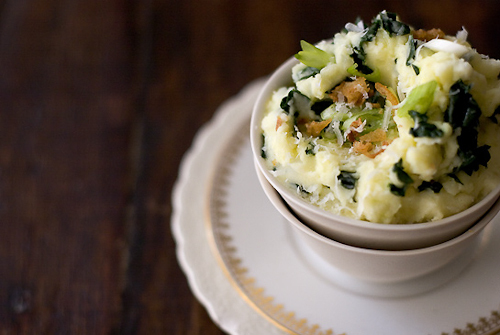 Our super green makes even mashed potatoes seem virtuous in this Kale and Olive Oil Mashed Potatoes. 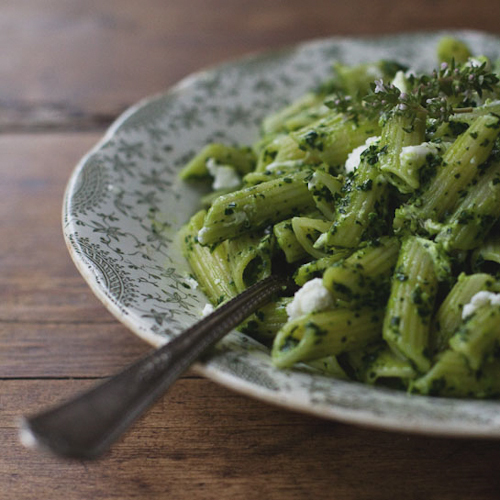 This recipe for Winter Pasta turns pureed kale into a sauce. This pasta dish would be great hot or cold. 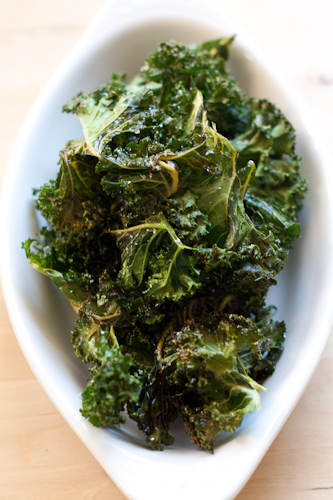 Kale Chips make a great crispy snack. Experiment with different seasonings for variety (Old Bay, parmesan, cayenne, vinegar). In fact, the dressing from the Kale Caesar Salad gave my kale chips good cheesy, salty flavor. Just toss the kale in the dressing before baking. And finally, my favorite way of getting in veggies. 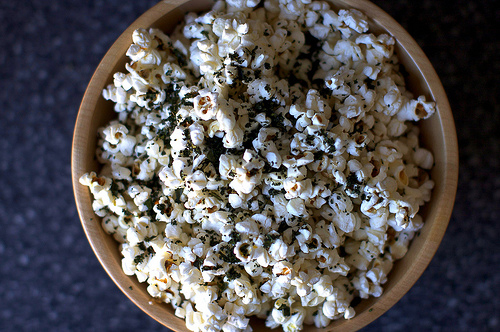 No one will suspect healthy vitamins hiding out in a big bowl of Kale-Dusted Popcorn. Fresh, cruciferous ribbons of green coated in salty, garlicky, lemony dressing. 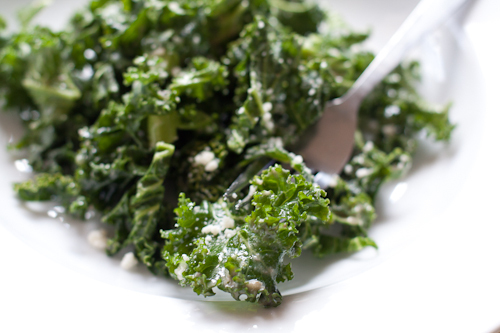 This raw Tuscan Kale salad is astonishingly addictive. Adapted from the Raw Tuscan Kale Salad with Chiles and Pecorino recipe in Melissa Clark's In the Kitchen with a Good Appetite. Rinse the kale thoroughly and shake dry. Trim the bottom few inches of the kale stems and discard. Roll the leaves up lengthwise and chiffonade them so that you get thin ribbons. Place in a large bowl. Using a food processor or blender, combine all the ingredients for the dressing except the olive oil. Blend until everything is combined. While the food processor/blender is running, slowly drizzle in the olive oil. Toss the kale with as much dressing as you'd like (this recipe makes more than enough – I like to keep extra in the fridge). Let sit for at least 5 minutes before serving. Note: This salad is great for parties because it gets better as the leaves absorb the dressing. Unlike more delicate greens, the kale stands up well and won't get all wilty on you.